How can blind people experience an art exhibition when some of the artworks appear on screens, involve paint or can’t be touched? How can colour become meaningful if you've never seen it before? How can you rediscover a medium that may seem increasingly out of reach if you are blind or losing your sight? 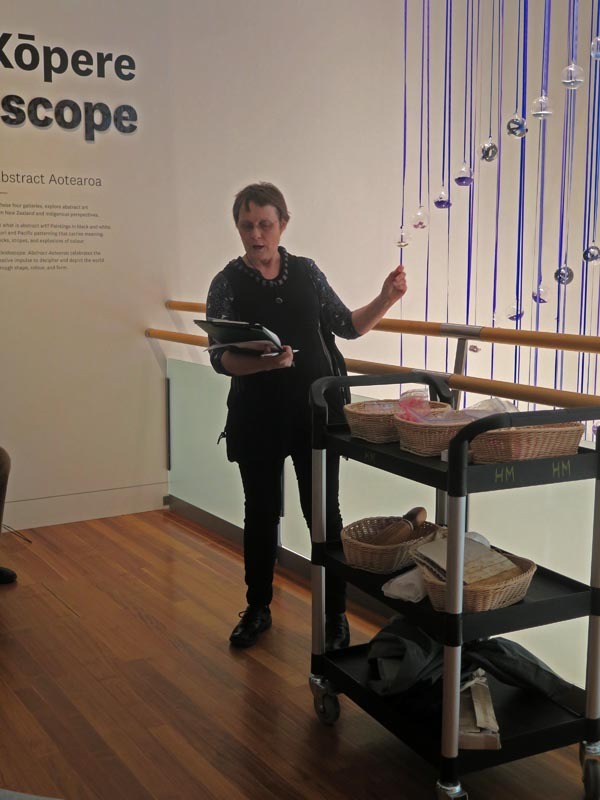 One recent Sunday afternoon, I joined eight other members of the visually impaired and blind community for a sensory art tour at Te Papa to experience an exhibition called Kaleidoscope: Abstract Aotearoa. The tour was led by Judith Jones, a trained audio describer who also works as a host at Te Papa. "The exhibition I’ll be describing today asks how colour, shape and pattern have captured our imaginations in the Pacific,” explains Judith as we exit the lift and head towards our first stop. Judith and another Te Papa staff member magic up some portable stools for us, and we perch a few metres away from the first spectacle. It’s called Indra’s Bow by Tiffany Singh. We listen intently to Judith as a picture slowly emerges. The work hangs from 4.5 metres above us, and into the emptiness that ends on the floor 4.5 metres below the level of this one, we’re told. The frame of the work is an array of four arcs, made from seven-metre-long ribbons in varying shades of the colours of the rainbow. The arcs hang from four wires with 82 ribbons in an arc. The end of each ribbon is tied to a loop at the top of a small, round, clear glass vessel. At the other end of each ribbon there’s a tiny brass bell … The overall effect is of an arc of hovering glass orbs, echoed by an arc of dangling brass bells below. Judith’s audio description then goes on to inform us about the natural ingredients contained in the orbs, and we are invited to engage our senses of smell and touch. Several of the ingredients are passed around, including kumkum powder, goji berries, peppercorns, feathers and dragon blood resin incense. Finally, we watch a clip featuring the work's creator, Tiffany Singh. She explains what the work is all about and connects the colours represented by the ribbons with the Indian concept of the chakras, while spotlighting natural, sacred medicinal ingredients in the orbs. I am struck by the power of an artwork to bring the sacred dimension of the natural world into relief. What on earth is a paint strip? I wonder. I'm handed what feels like a piece of flexible plastic, something like one of those hanging store-entrance curtains. It turns out this strip really is solidified paint. 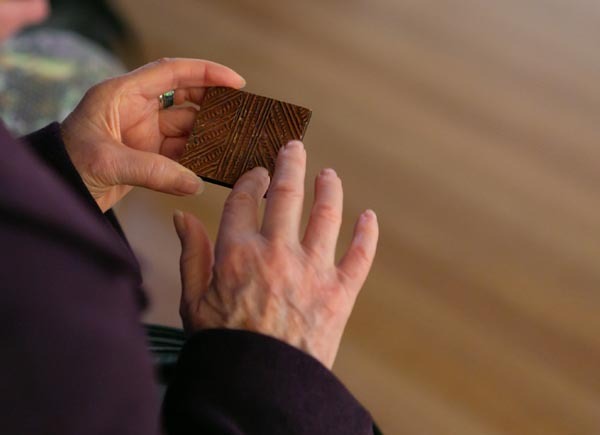 “This pattern is called Takarangi - the Cosmos," says Judith, handing me a small square wooden panel with a design featuring two spirals circling outwards from its centre, little triangles imposed on top of the spiral. It's a miniature version of the actual whakairo or carving, originally created for the children's discovery area but now serving our group well as we explore the careful detail on the wood. Over the course of the tour, which lasts for one-and-a-half hours, we cover eight works. One work is a silent, animated film with varying bursts of coloured light in geometric designs coming and going on the giant, glittery screen. Its main attraction for visitors is apparently that you can project your own shadow on to it. 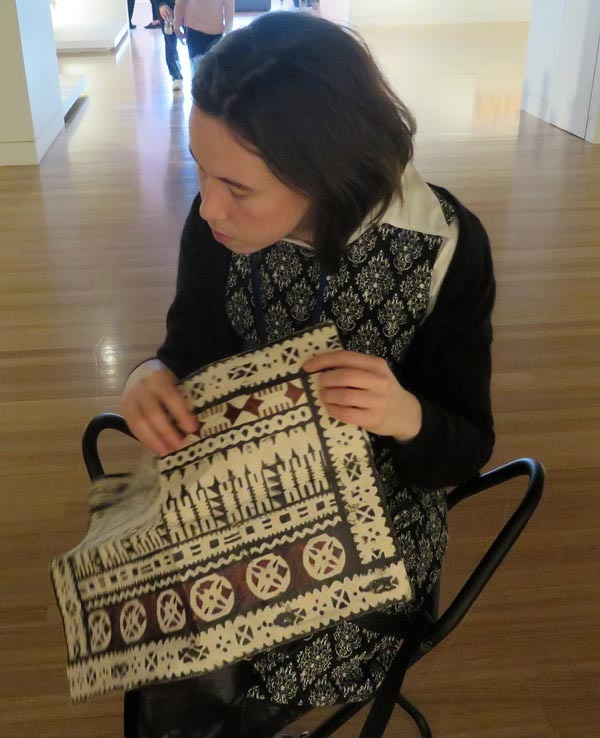 Another work is made of the Fijian barkcloth masi; a third, of lashed or tightly wrapped woollen cylinders. We also encounter a sort of colour variation generator made of wall clocks of differently coloured cards that rotate around a central horizontal axis (think wall calendars whose pages fall down at random). After the tour, we take the lift again and find some comfortable couches for a cuppa and biscuits. Someone has worked out that providing free food is a good way to get feedback. At moments, I say, I found the description covered a dizzying array of detail very quickly. My comment is noted. I also try to convey my appreciation for a tour so thoroughly thought through and well-put-together. The exhibition has been a kaleidoscope indeed, not least for the ability of its colour, shape and pattern elements to transmute so we can experience them not just through sight but also through language, sound, touch and even smell. Article 29 of the UN Convention on the Rights of Persons with Disabilities enshrines our right to take part in “cultural life”, including the arts, on an equal basis with others. It is one thing to know, intellectually and theoretically, that the right exists. It’s quite another to experience instances where it is realised. 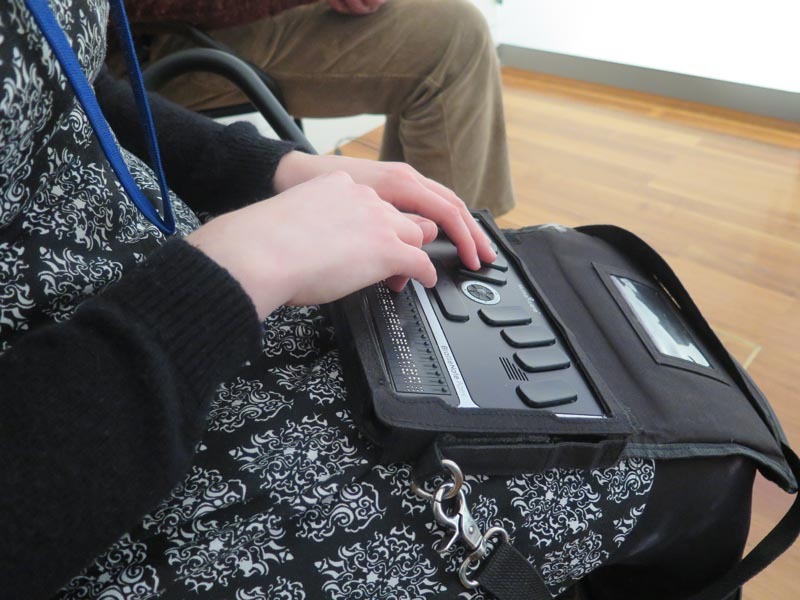 The work of Judith Jones, Audio Described Aotearoa and others in professionalising and enabling blind and low vision people to access the arts is welcome and valuable. I can only hope it will continue to be funded and grow further from here. We can now articulate what we would be losing without it. Áine Kelly-Costello is an Arts Access Advocate. She works as a community organiser with the Access Matters campaign and is interning as a digital news producer at Newshub. Te Papa’s sensory art tours invite participants to discover New Zealand abstract art through audio description, the handling of objects, and discussion of selected artworks. You can visit Te Papa's website and also email Judith Jones (judith.jones@tepapa.govt.nz) if you would like to be notified when a sensory art tour is scheduled. Original generation time 1.6047 seconds. Cache Loaded in: 0.0621 seconds.